K-State baseball made Tuesday’s 11-5 road loss to Wichita State look respectable with three late runs, but the Wildcats were never really in it thanks to stellar pitching by Sam Hilliard and a forgettable outing by Wildcat senior Mark Biesma. The loss snaps K-State’s (23-25) six-game winning streak over Wichita State dating back to 2012. 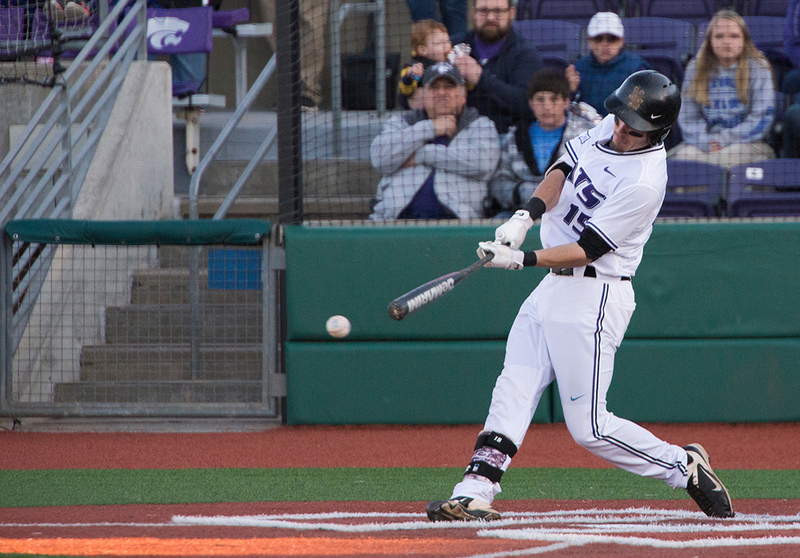 The Shockers nearly snapped the streak earlier this season in Manhattan in a 10-inning thriller capped off by a Wildcat walk-off. Wichita State struck first in the opening frame on a single to centerfield to take a 1-0 lead. The Shockers then added five runs in the second inning to take a commanding lead, which was never threatened. Beisma was chased early in the second inning after two runs scored on a pair of walks and singles to open up the inning. Junior Brandon Erickson took over and gave up a bases-loaded single that scored three. 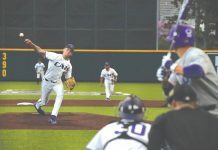 Out of the five pitchers K-State sent to the mound, only one, freshman closer Mitch Plassmeyer, was able to escape an inning without allowing a run. The Wildcats responded to the early deficit in the third inning on senior infielder Shane Conlon’s single, which brought around junior infielder and Big 12 Newcomer of the Week Tyler Wolfe and junior outfielder Clayton Dalrymple. The single pulled K-State within 6-2 and marked Conlon’s 200th career hit. Wolfe extended his on-base streak to a career-high and team-high 13 games. Wichita State grabbed a six-point advantage again in the bottom of the third inning on a single and error and then put the game out of reach in the sixth inning on a three-run home run. The big fly was the home team’s third multi-hit inning of the game and provided Hilliard with more than enough insurance with an 11-2 lead. The Wildcats did make an attempt at a rally in the final two innings as junior catcher and reigning Big 12 Player of the Week Tyler Moore doubled and scored Conlon to cut the lead to 11-3. Freshman outfielder Sam Chadick then tripled to right to score senior infielder Carter Yagi in the top of the ninth inning. Chadick reached home on a wild pitch to score his team’s fifth and final run of the game. Despite the final scoreline, Conlon singled into left following the wild pitch to secure the senior’s 200th-career hit. Conlon is just the 18th player in school history to reach that milestone. Biesma earned the loss for K-State, which is 5-5 in midweek games this season. Hilliard tallied his first win of the season for Wichita State. The Wildcats will return home this weekend for the final home series of conference play as they welcome in Oklahoma.